a decrease of 2.15 percent from 2006.
concessions is cleared and left to lie fallow without a clear purpose. land concessions until a proper monitoring system was put in place. The new figures on land concession area represent an increase of roughly 300,000 hectares from 2006.
take advantage of conservation programmes. economic land concession,” Emmett said. occurring as quickly as in other countries in the region. He noted, however, that areas of degraded forest or partially cleared land are sometimes tallied as forested. “It doesn’t necessarily fully represent the quality of the forest as well as the quantity of the forest,” he said. and played an active role in combating forestry crimes”. logging trade were seldom prosecuted and continued to profit from it. 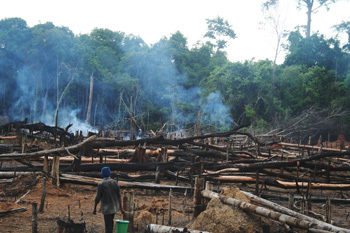 The HRP, he added, has been consistently ignored in its calls to conserve forests and reduce land concessions.